There so many new things going on in my life, and this blog is one of them. I have moved my blog over from one server to another, and although I already made one post, this is my first one since the official switch-over (I was still in transition when I posted the last one). Another new thing happening is my cookbook. After speaking with my publisher, I’ve decided to revamp my cookbook, What, No Meat? Traditional Italian Cooking the Vegetarian Way. It’s going to have a new design, new cover, and even a new title. When I first published it on my own in 2008, and then with Bedazzled Ink in 2010, it seemed to work as it was. But a few years down the road, I decided that it was time for a change. I was no longer happy with my book’s appearance, and I don’t really think my publisher was, either. So, now I’m in the process of editing it. I’m removing material and recipes and taking photos for the interior. It’s been a more complicated process that I had anticipated for various reasons, but I’m getting there. I hope to have the new one ready in the next couple of months. 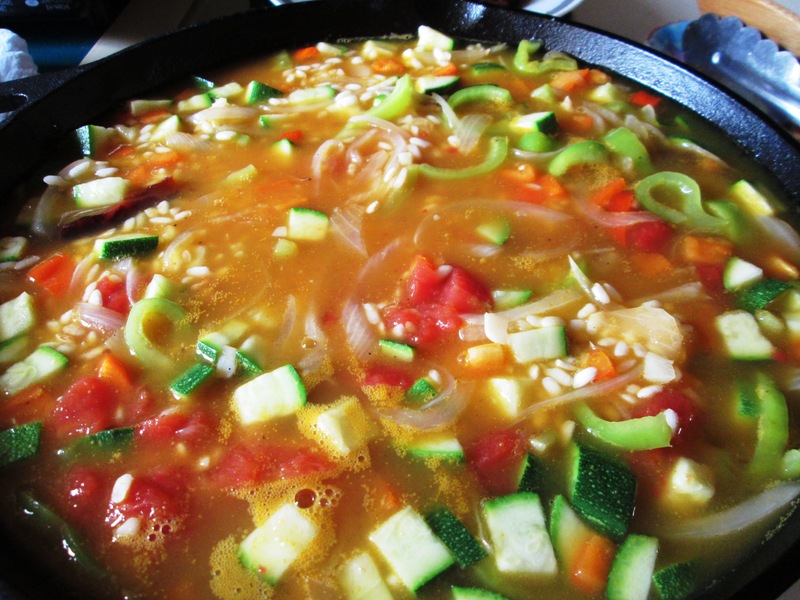 In the meantime, I wanted to share my recipe for Vegetarian Paella. Those flat, paddle-shaped leaves you see in the photo is a type of fresh oregano, but since fresh oregano is hard to find for many people, I use dry oregano in the recipe. Enjoy! 1. Heat 1 tablespoon oil in a large skillet. 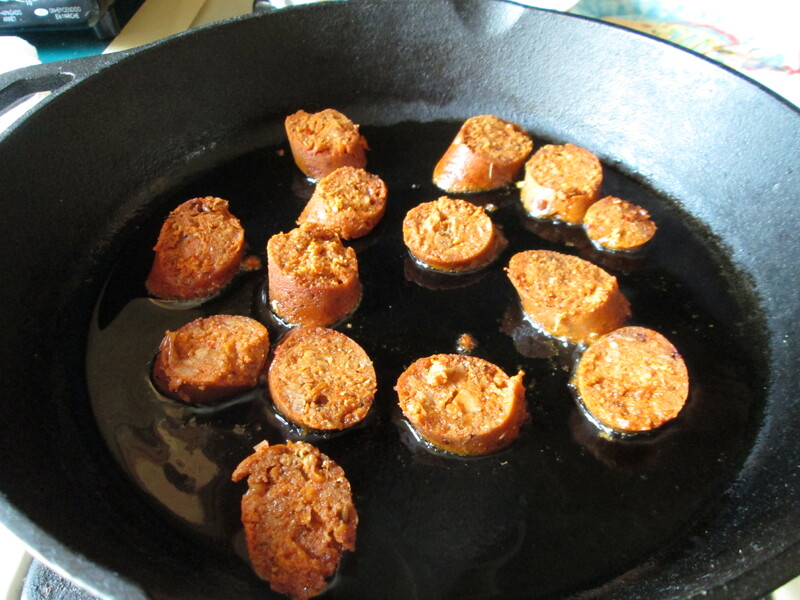 Add the chorizo and brown on both sides. Remove to a plate. 2. Add the remaining oil to the pan and heat. Add the onion and 1 teaspoon salt and sauté until translucent. Add garlic and red and green peppers. Saute until softened. 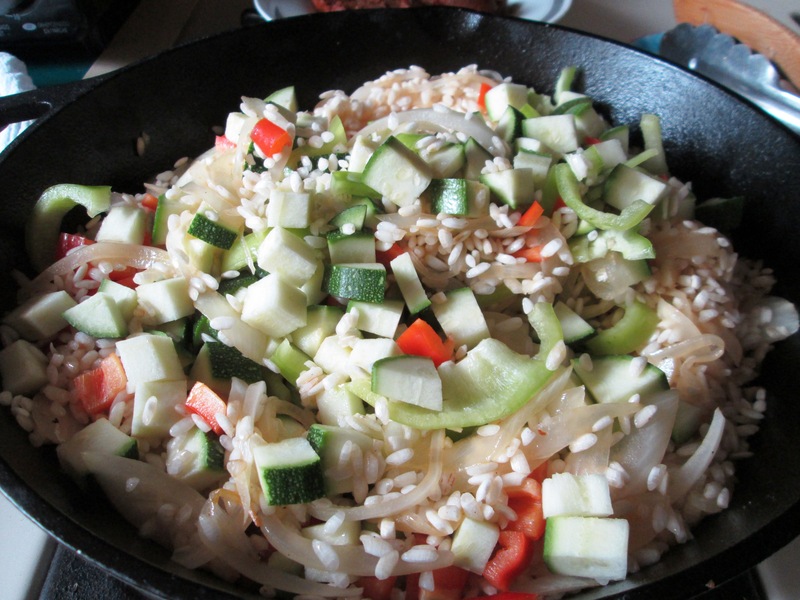 Add rice and saffron; stir to combine and stir-fry to toast a little. 3. Mix in tomatoes, zucchini and oregano. Cover and cook 5 minutes. Add stock and kale; cover and simmer 20 minutes. 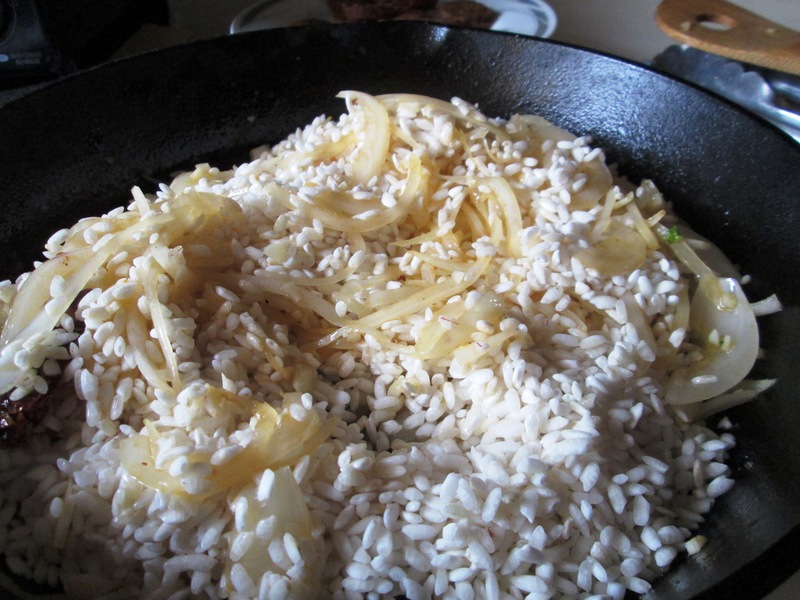 (If rice is not fully cooked, add a little more stock or water and continue simmering until done.) Stir in peas and cook another 5 minutes. Add the remaining salt if desired and season with pepper. 4. 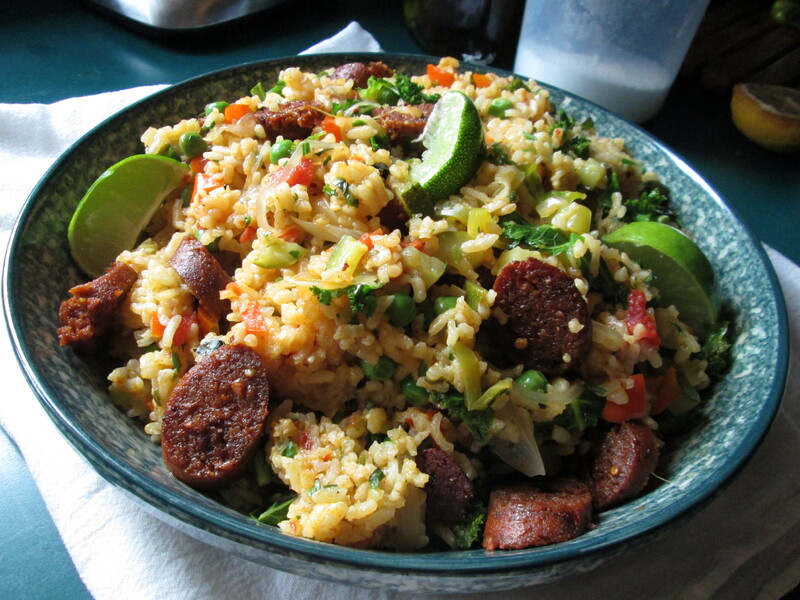 Return the chorizo back to the pan and mix in, along with the parsley. Transfer to a serving platter and garnish with lemon or lime wedges. Categories: Ethnic Dishes, Healthy eating, Uncategorized, Vegan, Vegetarian | Tags: cookbook, new beginnings, paella, vegan, vegetarian | Permalink. I love a good vegan paella. This looks wonderful! 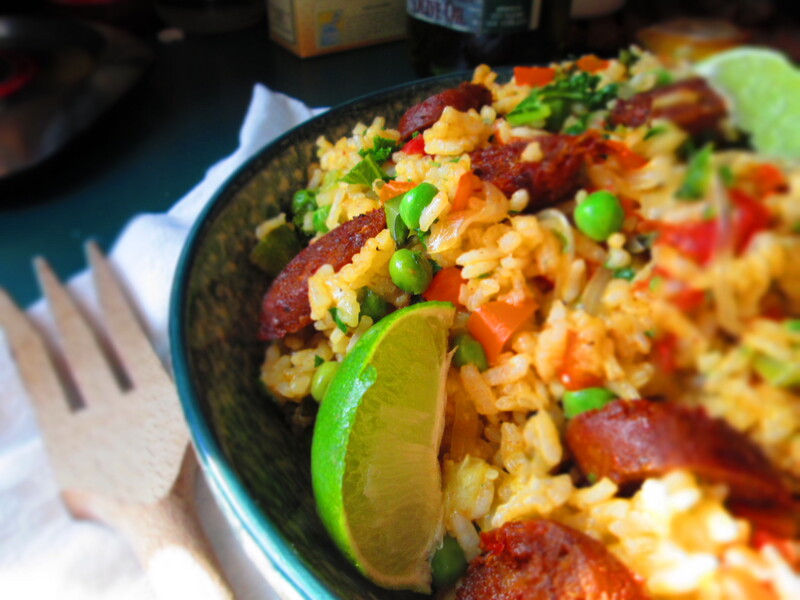 I like the addition of veg chorizo to give it that extra something special! Looks great! I’m a carnivore, but I like a meatless dish as least once a week. This one is definitely on the list. Love the kale! Oooo, that’s sounds like it will be amazing!